7 lessons learned by observing how airlines cut down on fuel costs. These lessons have never been more relevant. Skyrocketing fuel costs are causing havoc in airline business. Airlines face a dire need to significantly cut down fuel costs if they want to stay in business. Some of them have come up with some very creative ways I thought worth mentioning. I believe this glimpse into how the biggest corporations deal with rising fuel costs will provide us with valuable lessons to implement in our own personal lives. The key words being: Quick adjustment, rapid action and creativity. Fuel prices now account for over 40% of airlines operating expenses (compared to 15% eight years ago). This is easily their highest expense and they will naturally focus on creative ways to reduce it. Lesson #1: Recognize the situation you’re in and respond promptly. Quickly adjusting to a new, less fortunate, financial situation is crucial to successfully riding it through. Lesson #2: Identify your budget busters and focus on them. You’ll get the most saving out of those items. Airlines next identified the major cost drivers for their budget busters. In the case of fuel costs these are: Weight and Speed. Lesson #3: Identify the major cost drivers behind your budget busters. Reducing expanse requires dealing with these first. U.S Airways have eliminated snacks. Japan Airlines is using crockery in first-class and business-class cabins that is 20 % lighter than the service items they replaced. 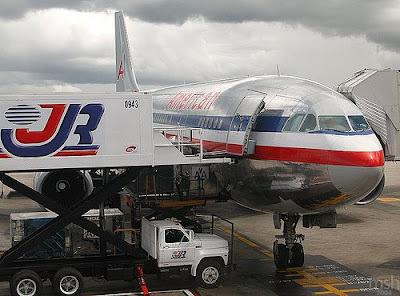 American Airlines has switched from using onboard power units that draw down jet fuel while planes are parked at gates to electrical generators on the ground. Deutsche Lufthansa, Europe’s second-largest airline, is one of several that has begun washing planes more frequently because dirt on a fuselage increases wind resistance. As speed goes, a number of airlines are flying their planes somewhat slower in order to save fuel — 480 mph, for example, instead of the usual cruising speed of 500 mph. This translates to about a 6 minute increase in flight time from LA to Atlanta. Delta is studying whether it is feasible to divide the heavy pilot manuals required on each flight between the captain and first officer, so pilots are not toting duplicate sets. Airlines are swapping heavier seats for models weighing about 5 pounds less. American is replacing its bulky drink carts with ones that are 17 pounds lighter. Northwest is putting 25 percent less water for bathroom faucets and toilets on its international flights. According to airline executives every 25 pounds removed equals saving $440,000 a year. Lesson #4: You can save on even the most straightforward expenses by being creative. Creativity goes a long way. Lesson #5: Small changes and small steps amount to big differences. Don’t underestimate small efforts. Airlines come up with various surcharges. I believe these are less successful since the public will not associate these extra charges and costs with rising fuel prices and will not take them kindly. For change or a saving effort to succeed it has to be associated properly with the cost driver. I believe none of us objects to reducing the amount of extra water on board. Lesson #6: Educate and market the change properly. Associate it with the expense and the cost driver. Economics will force airlines to implement even more radical solutions like charging by the pound. When fuel prices are low enough airlines have no economic and financial motivation to implement a “by the pound” billing system. However financial motivators can be extremely strong. High fuel costs will force airlines to consider how much weight each passenger contributes in order to charge him properly. Naturally, this will start with baggage. Each of us will be “motivated” through a financial fine to carry less baggage when traveling. If fuel prices remain as high we will soon pay for two tickets: one for ourselves and the other for our baggage. The day is not far away when we just might pay by pounds for our own weight as well. Apparently South West Airlines are asking passengers to buy a second seat if their girth prevents the armrest from lowering. Lesson #7: When a resource is not priced properly waste is created. A proper economic value assigned will help prevent waste and promote saving. Learning from the airlines recent experience is a free lesson offered to us all. As always I’d love to hear more lessons you’ve noticed and learned which I may have overlooked.